The Weymouth Arms is one of the oldest licensed houses in Warminster. Originally a substantial private house, it has a lot of history that has been lost but, fortunately, over the last few years has been gradually rediscovered. A beautiful tudor fireplace in the main bar featuring the Emwell Cross was blocked for many years, and was re-discovered during renovation works, when the house was owned by Messrs. Ushers Wiltshire Brewery of Trowbridge. One of the first floor windows is similar in design to those found at Chantry in the High Street, and relates to some degree to designs by Sir Christopher Wren. In the outer buildings at the back of the premises, one archway bears the date of 1749 with the initials T.M. and another date 1771 with the initials D.C. for Daniel Capel a well known clothier. Surmounting the oldest portion of the building was the small tower. Here workman found a farthing bearing the date 1649. The oldest sash window in this tower ran on wooden rollers and the sash cords were of gut. Daniel Capel haled from Gloucester. He was apprenticed to George Wansey a well know Warminster clothier, in 1756. He was to learn the clothing trade for a period of three years at a fee of Â£40.00 per annumn. In 1756, George Wansey agreed to keep Capel on for another year, providing he paid for his own board and lodging. Capel must have learned his trade particularly well to have acquired the house in 1771 and to have a thriving business of his own. The Inclosure award of 1782 and the 1801 survey of Warminster records him as the owner and occupier of a property with workshops at the rear. Daniel Capel died aged 71 in 1808. By The 1820s, the Warminster clothing trade had declined and the property became a common lodging house. Locally, the Weymouth Arms was known as the Drum and Monkey, but it is doubtful whether this was the real name of the inn. Until a few years ago the inn formed a lodging house for the town, and no doubt in bygone days, itinerant traders and traveling musicians with their drum and monkeys found lodgings here. After renovations had been carried out at the Weymouth Arms in the late 1920s, the application had been put in for the inn to revert to the normal public house. It has remained so to the present day. 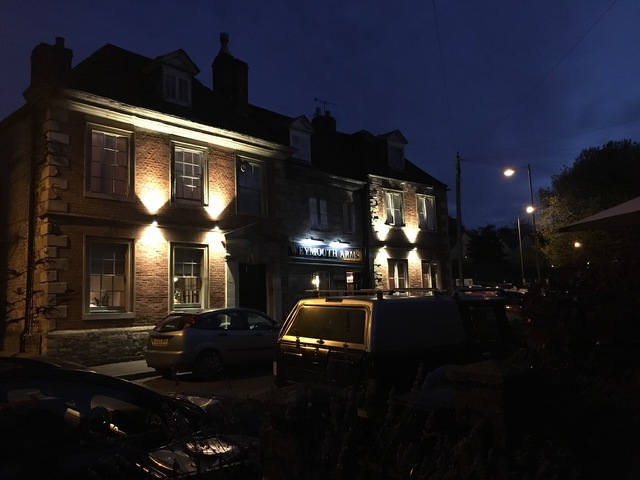 In 2009 Shane and Natallia purchased the Weymouth Arms from Enterprise Inns, and over the next few years sympathetically restored and turned it into a traditional beautiful English Inn. The Weymouth Arms today boasts a beautiful restaurant, an open kitchen, walled patio garden, fully functional restored cellar and bar, conference room and 3 en-suite bedrooms that are tastefully furnished, each with their own unique character. Their efforts were recognized by the Civic Trust in 2010 for sympathetic restoration of the property.